Home > Headaches > What is a Spinal Tap Headache? A spinal tap headache is a common side effect of having a spinal tap or an injection of anaesthetic in the spine. It occurs in about 3 in 10 people who have either of these medical procedures. A spinal tap may need to be carried out to extract a small amount of spinal fluid for analysis to see if an infection of the brain is present. Analysis of spinal fluid is also useful in the diagnosis of multiple sclerosis or other nervous system problems, to detect some kinds of nervous system cancers and to see if there is any bleeding in the brain or spinal cord. If the level of cerebrospinal fluid is too high, a spinal tap can relieve that pressure by draining off some of that excess fluid. An injection of anaesthetic into the spine may be needed to provide pain relief to a woman in labour, to provide complete anaesthesia for a caesarean section, or to enable other types of surgery to take place in the lower body without the need for a general anaesthetic. Why does a Spinal Tap Headache Develop? Usually, only tiny amounts of fluid are removed from the spine for analysis and, in the case of spinal anaesthesia, fluid is not removed intentionally at all. The problem is that fluid does tend to leak out in some patients after the needle used to aspirate fluid or to introduce anaesthetic has been withdrawn and this causes the after effects of a headache. The more fluid that escapes, the worse the headache tends to be. The loss of fluid causes a drop in pressure in the spinal fluid that surrounds the spine and also the fluid that bathes the brain. The brain is very sensitive to changes in pressure, which causes abnormal electrical signals and disturbs blood flow, both of which can lead to pain. Typically, this begins within 12 to 24 hours of the spinal tap or spinal injection. What are the Symptoms of a Spinal Tap Headache? Generally, the headache can last just a few hours and can get better on its own without treatment. Sometimes, though, the pain is very severe and is accompanied by nausea, disturbances in vision, tinnitus and dizziness. It is very common for the headache to get worse when the person affected stands up and is greatly relieved by lying down. Usually, the headache disappears within 24 hours but if it doesn’t, treatment or further investigation may be necessary. If you have to have a spinal tap or an epidural, it is wise to be aware that spinal tap headaches can occur, but not to worry too much. Headaches are common and your headache may not be related to the procedure, particularly if it starts more than 24 hours later. If the headache does seem to be a spinal tap headache and it doesn’t go away on its own within a day or so, there are various treatments that can prove successful. One is a very simple method that introduces a small quantity of your own blood just over the puncture hole, which may still be leaking fluid. As the blood clots, the hole is sealed and the pressure normalises very quickly, curing the headache. Treating the symptoms is also possible – a caffeine injection will help to narrow the expanded and dilated blood vessels in the brain that are responding to the low fluid pressure and should bring pain relief within a few hours. 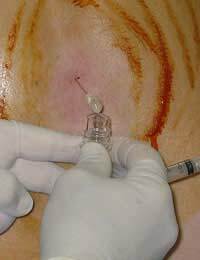 Saline solution can also be injected into the spinal cord, at the other side of the membrane, so that no more fluid leaks out. This can be a useful temporary measure until the body can start its own healing process, but headaches can come back after a few hours as the saline is absorbed. Hoping someone can give me help/advice. Around 9/10 weeks ago I caught a viral infection which lasted 2 weeks. I then got a sudden onset of a headache which after lasting a week and no medication helping I was admitted to hospital had CT which was clear. Lumbar puncture was clear but then I got a post lumbar puncture headache!! I was discharged still in agony and was told it should pass in a few days. It didn't! Then back to gmeds who gave me a diclofenic injection and diclofenic and diazepam tablets which settled the pressure and pain. I then went on holiday for two weeks..still in pain. So now 8 weeks since lumbar puncture..in pain every day I'm off my work and it's affecting my life. I'm trying alternative therapies at the moment but no success yet. All the doctor is offering is medication which isn't helping! I have lost count how many different ones they have tried. I'm getting so frustrated and upset!! I just want the pain away!